Properties in Graeme Hall Park average 4.5 out of 5 stars. Property 12: Great location for the adventurous traveler! Property 16: Mistle Cove Apartment 101, Ground Floor Beach-front, private garden and pool. 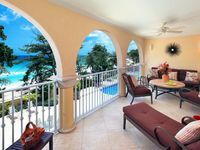 105 Sapphire Beach Condo (2Bedroom/2Bathroom) On The Dover Beach, Barbados. Property 26: 105 Sapphire Beach Condo (2Bedroom/2Bathroom) On The Dover Beach, Barbados. Property 31: Booby Duck Cottage, St. Lawrence Main Road. All the boxes checked for an amazing vacation! I stayed at Ocean Sky Apartments for two weeks. Very conveniently located. Rebecca and Nita are wonderful hosts. Friendly, super efficient and professional. I would definitely stay again on my next trip to Barbados.